Graphene – an ultrathin material consisting of a single layer of interlinked carbon atoms – is considered a promising candidate for the nanoelectronics of the future. In theory, it should allow clock rates up to a thousand times faster than today's silicon-based electronics. Scientists from the Helmholtz Zentrum Dresden-Rossendorf (HZDR) and the University of Duisburg-Essen (UDE), in cooperation with the Max Planck Institute for Polymer Research (MPI-P), have now shown for the first time that graphene can actually convert electronic signals with frequencies in the gigahertz range – which correspond to today's clock rates – extremely efficiently into signals with several times higher frequency. The researchers present their results in the scientific journal Nature. Today's silicon-based electronic components operate at clock rates of several hundred gigahertz (GHz), that is, they are switching several billion times per second. The electronics industry is currently trying to access the terahertz (THz) range, i.e., up to thousand times faster clock rates. A promising material and potential successor to silicon could be graphene, which has a high electrical conductivity and is compatible with all existing electronic technologies. In particular, theory has long predicted that graphene could be a very efficient "nonlinear" electronic material, i.e., a material that can very efficiently convert an applied oscillating electromagnetic field into fields with a much higher frequency. However, all experimental efforts to prove this effect in graphene over the past ten years have not been successful. "We have now been able to provide the first direct proof of frequency multiplication from gigahertz to terahertz in a graphene monolayer and to generate electronic signals in the terahertz range with remarkable efficiency," explains Dr. Michael Gensch, whose group conducts research on ultrafast physics and operates the novel TELBE terahertz radiation source at the HZDR. And not only that – their cooperation partners led by Prof. Dmitry Turchinovich, experimental physicist at the University of Duisburg-Essen (UDE), have succeeded in describing the measurements quantitatively well using a simple model based on fundamental physical principles of thermodynamics. With this breakthrough, the researchers are paving the way for ultrafast graphene-based nanoelectronics: "We were not only able to experimentally demonstrate a long-predicted effect in graphene for the first time, but also to understand it quantitatively well at the same time," emphasizes Prof. Dmitry Turchinovich. "In my laboratory we have been investigating the basic physical mechanisms of the electronic nonlinearity of graphene already for several years. However, our light sources were not sufficient to actually detect and quantify the frequency multiplication clean and clear. For this, we needed experimental capabilities which are currently only available at the TELBE facility." The long-awaited experimental proof of extremely efficient terahertz high harmonics generation in graphene has succeeded with the help of a trick: The researchers used graphene that contains many free electrons, which come from the interaction of graphene with the substrate onto which it is deposited, as well as with the ambient air. If these mobile electrons are excited by an oscillating electric field, they share their energy very quickly with the other electrons in graphene, which then react much like a heated fluid: From an electronic "liquid", figuratively speaking, an electronic "vapor" forms within the graphene. The change from the "liquid" to the "vapor" phase occurs within trillionths of a second and causes particularly rapid and strong changes in the conductivity of graphene. This is the key effect leading to efficient frequency multiplication. The scientists used electromagnetic pulses from the TELBE facility with frequencies between 300 and 680 gigahertz and converted them in the graphene into electromagnetic pulses with three, five and seven times the initial frequency, i.e. up-converted them into the terahertz frequency range. "The nonlinear coefficients describing the efficiency of the generation of this third, fifth and seventh harmonic frequency were exceptionally high," explains Turchinovich. "Graphene is thus possibly the electronic material with the strongest nonlinearity known to date. The good agreement of the measured values with our thermodynamic model suggests that we will also be able to use it to predict the properties of ultrahigh-speed nanoelectronic devices made of graphene." Prof. Mischa Bonn, Director of the MPI-P, who was also involved in this work, emphasizes: "Our discovery is groundbreaking. We have demonstrated that carbon-based electronics can operate extremely efficiently at ultrafast rates. Ultrafast hybrid components made of graphene and traditional semiconductors are also conceivable." The experiment was performed using the novel, superconducting-accelerator-based TELBE terahertz radiation source at the ELBE Center for High-Power Radiation Sources at the HZDR. 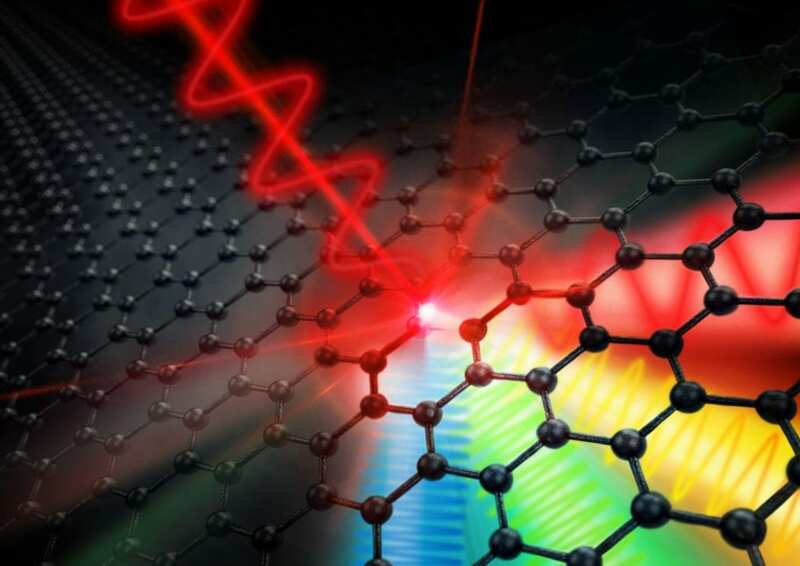 Its hundred times higher pulse rate compared to typical laser-based terahertz sources made the measurement accuracy required for the investigation of graphene possible in the first place. A data processing method developed as part of the EU project EUCALL allows the researchers to actually use the measurement data taken with each of the 100,000 light pulses per second. "For us there is no bad data," says Gensch. "Since we can measure every single pulse, we gain orders of magnitude in measurement accuracy. In terms of measurement technology, we are at the limit of what is currently feasible." The first authors of the article are the two young scientists Hassan A. Hafez (UDE/MPI-P) and Sergey Kovalev (HZDR).